I am excited for today's post for two reasons! I love a great giveaway and an awesome sale! 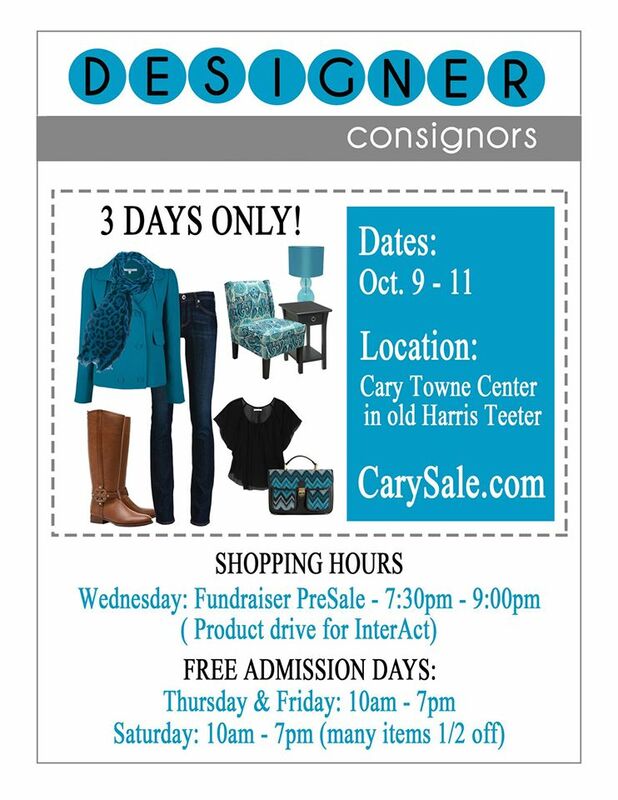 Designer Consignors is a biannual consignment sale held in Cary, North Carolina. Designer Consignors allows consignors to sell their gently used items, shoppers to purchase them at a discounted rate and vendors to sell and promote products. The fall and winter sale is coming soon and runs from Thursday, October 9 to Saturday, October 11. Plus, the great part about this sale is that they always do a charity drive Thursday evening of the event. This year's charity drive will be a product drive for InterAct. The upcoming sale will be my third time attending Designer Consignors and I absolutely love this sale. I like to shop on Saturday of each event because many of the items are 50% off! Earlier this year, I scored these beautiful statement necklaces at their spring and summer sale! To see pictures from previous sales, click here. I'm excited today because one of you will be able to win a $20 gift certificate to the sale thanks to Designer Consignors. The giveaway details are below. The giveaway will run from Friday, September 26 to Sunday, October 5. The winner will be announced on Monday, October 6. An e-mail will be sent to the winner and a response must be received within 24 hours or another winner will be chosen. The gift certificate is only valid October 9-11, 2014. Thank you again to Designer Consignors for sponsoring this giveaway!